The son of a Sac and Fox Indian father and a Potawatami Indian mother, Jim Wa-Tho-Huk Thorpe was born in Oklahoma in 1888. A natural athlete, he overcame family tragedies and personal hardships to become a star in not one, but three sports, and to win two Olympic gold medals. Despite losing his Olympic medals and status due to an innocent mistake, Jim continued to excel athletically, playing professionally in both baseball and football. He was named to the National Indian Football Hall of Fame, the Pennsylvania Hall of Fame, and the Pro Football Hall of Fame. Today, the NFL’s Most Valuable Player award is called the Jim Thorpe Trophy. In 1984, the U.S. Postal Service issued a commemorative stamp in his honor. 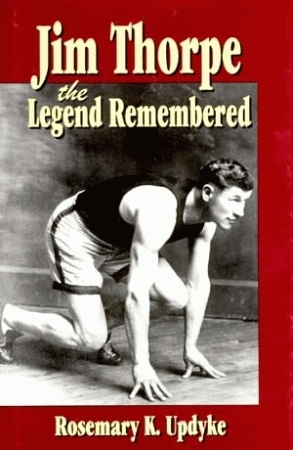 Jim Thorpe, the Legend Remembered tells the young reader all about Thorpe’s remarkable life; although he died in 1953, his accomplishments still teach the valuable lesson of perseverance. Author Rosemary Kissinger Updyke was born and raised in east Texas. She began her writing career in high school and is a member of the International Women’s Writing Guild and The Pocono Writers. She lives in East Stroudsburg, Pennsylvania, where she is active in local libraries. Her other book, Quanah Parker: Comanche Chief, is also published by Pelican.